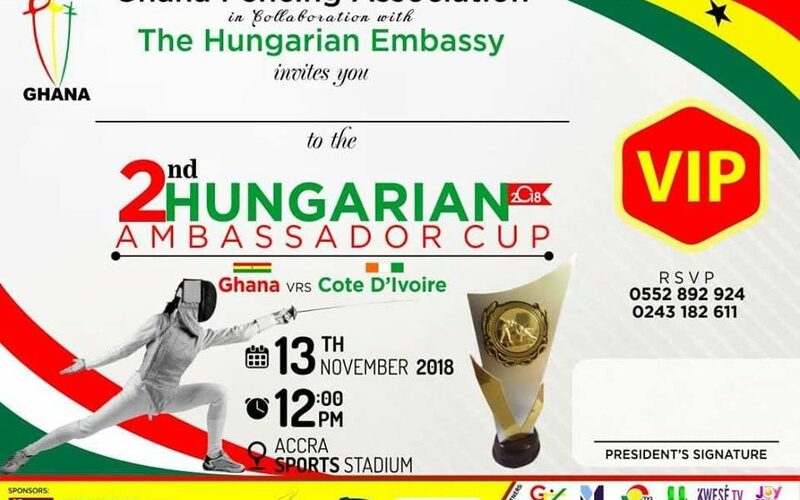 The Ghana Fencing Association (GFA) in collaboration with the Hungarian Embassy in Ghana is organizing the 2nd Hungarian Ambassador Cup slated for the Hathramani Hall of the Accra Sports Stadium on Tuesday 13 November. According to the President of the Ghana Fencing Association Mohammed Mahadi the competition is open to Fencers both male and female in good standing and the event will be used to select fencers for the national team to take part in national and international competitions in 2019. There will be special competition between Ghana and Ivory Coast on the day. The competition is been organize in collaboration with the Hungarian Embassy, to promote the discipline in Ghana and to honor the Hungarian Ambassador to Ghana His Excellency Andras Szabo for his support to the sport. Winners of the maiden edition in 2017 Thresec and Sogasco, in the male and female categories respectively received air tickets to Hungary for training camps and competitions.